Our bamboo pillow cases are made of 100% rayon bamboo fibers that are spun into a soft yarn and then woven into a silky woven cloth. Rayon Bamboo fibers are made up of natural fibers that guarantee a silky-soft good nights sleep. 100% cotton pillowcases hold heat. Bamboo fiber pillow covers breathe much better. As our body temperature rises while we sleep, moisture develops which in turn creates the growth of bacteria and germs. 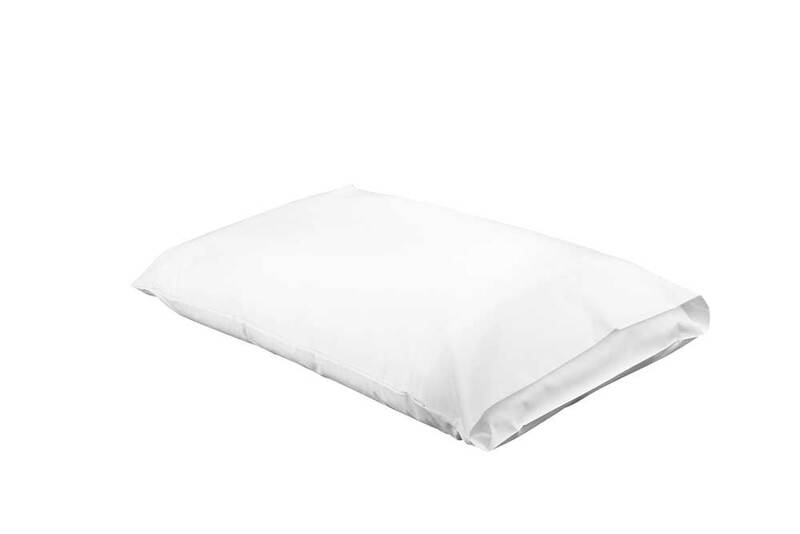 Bamboo pillow cases help rid the moisture and are anti-bacterial, helping pillow cases to stay fresh longer. The rayon from bamboo does not stick to the skin and is extremely silky soft to the touch. Bamboo pillow covers require less laundering care than 100% cotton. Environmentally friendly, silky soft, lightweight and luxurious. 100% rayon from bamboo fibers have nature antibacterial protection that wick away moisture for comfort. Bamboo is grown without pesticides and is naturally regenerated. The fabric is “three times more breathable than cotton." These pillow cases keep you at the optimum temperature for sleeping because of the breathability of the fabric, keeping you warm in the winter and cool in the summer. Offering you a more comfortable pillow case encouraging a peaceful dream. Rayon from bamboo fibers are more easily damaged by bleaching than other fabrics, therefore using baking soda in your wash cycle and white vinegar in your rinse cycle, are a better way of keeping sheets clean, bright and soft. Bamboo sheets also fair better with a cold-water wash, rather than a warm or hot water wash.
Bamboo Pillowcases 320 Thread CountBamboo Duvet Covers Set – WhiteBamboo Sheet Set 320 Thread Count Angel WhiteBamboo Sheet Set 320 Thread Count Stone CharcoalBamboo Sheet Set 320 Thread Count Ivory WeddingBamboo Sheet Set 320 Thread Count Sage GreenBamboo Sheet Set 320 Thread Count Chocolate BrownBamboo Sheet Set 320 Thread Count Bullet SilverBamboo Sheet Set 320 Thread Count Brick RedBamboo Sheet Set 320 Thread Count Saddle TanBamboo Sheet Set 320 Thread Count Dutch BlueLuxury Bamboo Sheets – 500 Thread Count White	 Hold down the Ctrl (windows) / Command (Mac) button to select multiple options. I thought they would be a little more "green" in color. Still happy with them. I was quite impressed with these sheets. I have the 500 thread count for my husband and I, and I bought the 320 for both my kids. We all love them! WOW! These are amazing. If you don't own these yet, BUY THEM NOW! Very good sheets. I prefer the 500 thread count to the 320 especially during the winter. I was shocked how soft these were. I have a few friends with bamboo sheets and they can't stop talking about them. Tried them myself and they are excellent! Holy crap! These are amazing. Highly recommend. Just saw the valentine sale! Buy them up. So cheap! These are amazing! It is like they are temperature controlled. My side of the bed stays warm, and my husband cold! The color of this red is really vibrant and amazing. I have them in a few colors and these are my favorite. I was surprised to find my sheets torn along the seam when I opened the packaging. The customer service helped me sort everything out. Once I received them I was very pleased but overall a long experience. I bought 10 sets of these for a fundraiser I was doing. They were such a hit everyone wanted to know where they were from. I hope they bought a few sets! Very comfortable and soft sheets. Definitely an upgrade from what I was using before! Bought these as gifts for my nieces and nephews for the holidays. They all loved them and have actually ordered extra sheets themselves since then. These are just ok in my opinion. I do not love them so I use them in my guest room. Got this color instead of the ones I wanted, but decided to keep them anyways because they are amazing! Was a little disappointed with the shipping time (4 days to Texas), but overall very pleased. Great sheets. Was recommended by my mother in law - she was so right about them! These are fantastic. Don't use any other sheets! Got these as a xmas gift exchange... thought was a bit weird but once I used them I told like 5 people to buy them! Bought a set for both my boys. They love them! Probably the most comfortable sheets I've ever used! Took a week to get... but quality is like none other. These came recommended by a friend. I bought a set for myself and one as a gift and we both love them! I had other bamboo sheets that got ruined after washing them twice. I have washed these at least 15 times and they are as good as when I first opened them! Not a fan of the color, but they are extremely soft and comfortable. These are actually the best sheets I've ever used! I ordered the wrong size, and the customer service helped me out without any problems. They are amazing and great service! Overall very satisfied, but have used better sheets (non bamboo). Best sheets I've ever used! Bought these a few months ago, ordered 2 more sets since! So amazing! So happy I ordered them! A must purchase if you want to stay in bed all day! I was a little disappointed in the color, it was not the exact silver I wanted, but the softness makes up for it. I wish I could wear clothing this comfortable all day... lol! These are amazing! Got these pretty much next day, and used them right away. They are awesome! I heard good things about bamboo sheets but wanted to see for myself. They are very comfortable. These are insanely great! Will never use other sheets! These are great sheets. Pillow cases are amazing too. Just got mine today! Can't wait to try them! Product is great. They sent me the wrong size but once I received the correct ones I was very happy with the sheets. Overall these were great. I couldn't use the pillowcases (I have very big pillows) but the sheets are great! Definitely the most comfortable sheets I've ever owned. These are amazing! Will never use any other sheets again! These are the best sheets I’ve ever experienced; smooth, cool, durable, and very affordable. Highly recommend. Unbelievable. I had very high expectation for Bamboo Sheets and these far exceeded them. Only problem I have now is that's impossible to get out of bed in the morning! I bought these sheets 1.5 years ago. They are wonderful and soft however one of the seems in the pillowcase has split and the top sheet is too small. This is the 5th pair of sheets I have bought over the years (3 for me and 2 as gifts). They are great sheets. I am always complimented on them. Whenever anyone lays on them, it is difficult to get them to get back up because they do not want to leave. They comment about how cozy and soft they are. I have now used only bamboo sheets for the past 4 years and they are wonderful. Cotton sheets just feel so rough and uncomfortable now. These are incredibly delightful; no other words can describe the sheer comfort of these sheets! I have always gone for Egyptian cotton sheets, but I was completely converted when I lied upon my Bamboo sheets for the first time. They are the only sheets that my husband doesn't profusely sweat on, and not to mention softer than anything I have ever felt. These sheets would make an amazing gift! I really like these, they are so soft! Very nice sheets. Very soft. I wanted bamboo because it's better for the environment. They do wrinkle a little bit, but doesn't bother me. For the first time in our 18 year marriage, my husband and I are able to sleep under the same blanket without feeling like we're in a furnace. These sheets are the best investment we've made in a long time. I'm also very impressed with the prompt responses I've received from the customer service department. We'll be outfitting our kids' beds ASAP. Service and follow-up were excellent! Our 500 thread count bamboo sheets and pillow cases arrived on a Sunday, even though I had just ordered two days earlier, on the Friday! The sheets are amazing: super silky and soft. What a pleasure to climb into bed! Thank you Bamboo Sheets Shop! Absolutely love these sheets. They are so much cooler to sleep on than cotton sheets...and so soft. Bamboo is for me! Bamboo is for YOU! Got my sheets a few days ago and have slept like a baby since! So comfy and soft, can't go back to anything else. The most comfortable sheets. Definitely worth the investment. Shipped quickly! I purchased these sheets for my wife for Valentine's Day and she (we) absolutely love them! They are the most incredibly soft and comfortable sheets! Highly recommended! Thanks! My friend recently recommended buying bamboo sheets. Originally we bought them because of my husband’s allergies. After owning many expensive and sateen sheets from Ralph Lauren et al we were so pleased and so comfy in these sheets. Matches perfectly with the 500 Thread count sheets i purchased last month. They feel great and look great. Amazing, ordered them last week and just started using them. They are better than my 500 dollar cotton sheets. Feel great and keeps the temperature consistent! Will order another couple sets soon. Absolutely Amazing, The sheets were amazing to start with but actually got better after a couple uses. Really happy with this purchase and I think that they are better than regular cotton sheets. Amazing duvet cover and didn't even realize but comes with 2 Bamboo pillow cases, what a deal. Best sheets I have ever owned and got my order in a matter of days! Will be ordering again soon in a new color. I bought these sheets for myself and some family for mothers day. These sheets are amazing! I've never felt anything that feels like they do... so soft. I don't get too hot or cold at night anymore either. Great sheets, follow the guidelines for washing! These are the best sheets I've ever experienced; smooth, cool, durable, and very affordable. Highly recommend.